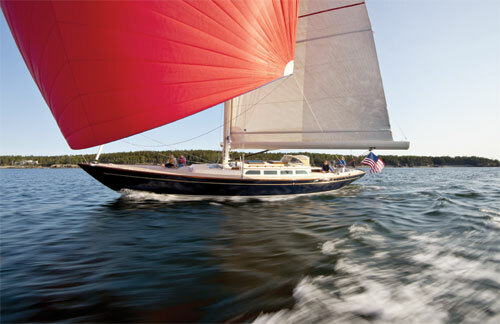 Morris Yacht's M36 has been turning heads for years. For some, though, the lack of a real interior was a problem. They wanted to be able to sail their gorgeous boat up the coast for the weekend, and by the way, they wanted to be comfortable doing it. And so the M52 was born. Designed by Sparkman & Stephens, its lines follow in the footsteps of the M36, and the interior in the footsteps of luxurious yachts of days gone by. There are two staterooms, each with its own head, and standing headroom throughout down below. White bulkheads, gloss varnished cherry joinery, a teak cabin sole, a drop-leaf table and comfortable molded cushions provide top-of-the-line fit and finish to the interior. An aft-facing nav station has room for chart storage as well as housing the electrical panel. The galley has a three-burner propane stove, DC refrigerator, Corian countertops and lots of storage for dishes, supplies and dry goods. Several hatches throughout the boat provide good ventilation. On deck, the spacious cockpit is where it's at. This boat is all about sailing comfortably, so the cockpit cushions are almost 7 feet long to fit a crowd or take a nap. Although the boat sports a healthy amount of sail area, the sail plan has been optimized for easy sailhandling with a carbon fiber mast, in-boom furling and electric primary and halyard winches. The fractional rig has a self-tacking jib, and all control lines are led below deck to keep the deck clear. The M52 is sold as a complete package, so there will be no hidden charges. Which means there will be that much more in the kitty for dinner at the four-star restaurant up the coast. LOA 52'11"; LWL 38'2"; Beam 14'; Draft 6'8", shoal 5'8"; Displ. 34,064 lbs. ; Sail Area 1,414 sq. ft.; Auxiliary 75-hp Yanmar; Water 100 gals. ; Fuel 80 gals.